Children ages 5 to 12 are invited to come read to a Humane Society of Marion County dog on select Saturday mornings at 11 a.m. Here’s how it works: The child must register in advance. 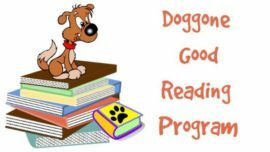 Registration can be completed online at http://thehsmc.org then click on Events tab and then on Doggone Good Reading Program Online Registration. Choose up to two dates you prefer. We will call and confirm the week before your date. Dates as follows: Maximum of 12 children per session. A parent/guardian must accompany the child and stay at the shelter (in a separate area) while the child is reading. This is because children do better when they are reading to a non-judgmental dog with no outside criticism.